Mr John Matthews, builder, was appointed Registrar for Marriages in Ashburton in 1838. George Morcombe, a builder from Ashburton, died in July 1839, leaving a widow and 8 children. He was 42. Philip Wootton of Bristol died in April 1843. He was the only son of the late William Wootton, a builder of Ashburton. Presumably this is the same Philip Wootton, builder, who was involved in letting an extensive house in East Street in 1810. 1885 T Easterbrook, builder, was selling a 'handsome bay gelding' in May. It was suitable for a lady to ride. In 1884 Mr Thuell, an Ashburton builder, supervised the renovation of the Baptist chapel in Fore Street, Moretonhampstead. When Emily Stewart died in London in 1893, aged 61, she was said to be the daughter of the late Mr Thomas Hext, a builder from North Street, Ashburton. The Wesleyan Chapel was renovated in 1896, with Mr Lear, builder of Ashburton, undertaking the work. It cost £300 to bring the chapel 'into line with modern ideas of what a place of worship should be.' Mr H Boon did the decorative work. 23 year old Horace Boon was a plumber and painter in the 1891 census. Married to Sophia and living in North Street, he had been born in Ivybridge. By 1901 he was an ironmonger. Horace and Sophia were on the electoral register until 1927, by which time they were living at Bowling Green. 20 masons were needed in 1873, and could expect 'liberal wages' if they were good workmen. Applicants were to contact Stevens, contractor, Ashburton. In 1876 Henry Stevens married Gertrude Alice Creach at Cradley*. Both bride and groom were from Ashburton. In the 1881 census Henry Stevens, aged 54, is living in Lawrence Lane with two daughters. A building contractor, he was born in Holwell, Dorset; his daughters Sara and Emma were both born in Alderney. Ten years later Henry Stevens is living at Hazeldene, Chuley Road, with his wife Gertruda A. A railway contractor, born in Holwell, Dorset, he is now only 56 (and his wife 47). Emma Stevens, youngest daughter of Henry Stevens, married Henry Luscombe Creagh in 1882. Her father, a building contractor, had lived in the town about 10 or 12 years, and was one of the largest employers. The wedding breakfast was held at Hazeldene, the bride's residence. 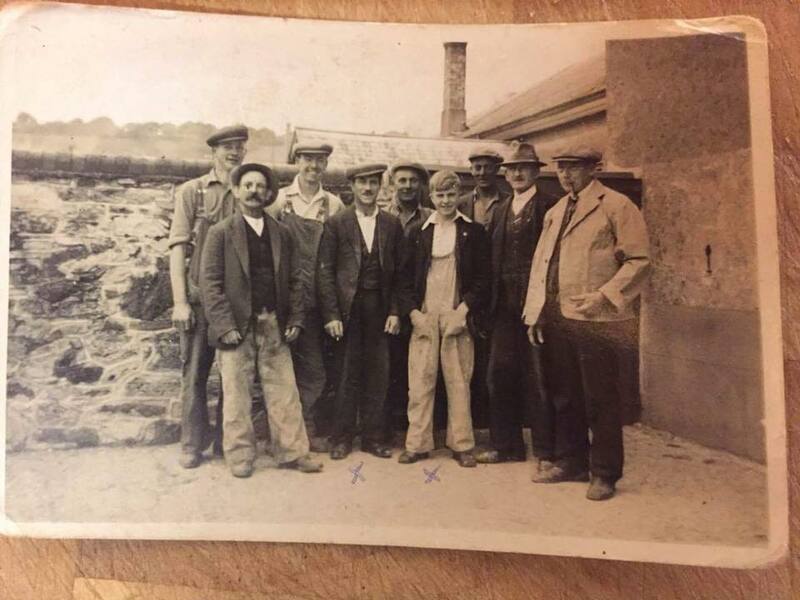 1883 Richard Whiddon, aged 16, was amongst several Ashburton men and boys working for Henry Stevens near Hayle, Cornwall, constructing a viaduct across the Angarrack Valley. Richard, the eldest son of John Whiddon, slipped and fell 50 feet, sustaining fatal injuries including a broken neck. The Whiddon family had at one time been associated with the Globe Inn. In August 1886 Mr Henry Stevens joined his employees on their annual wayzgoose. 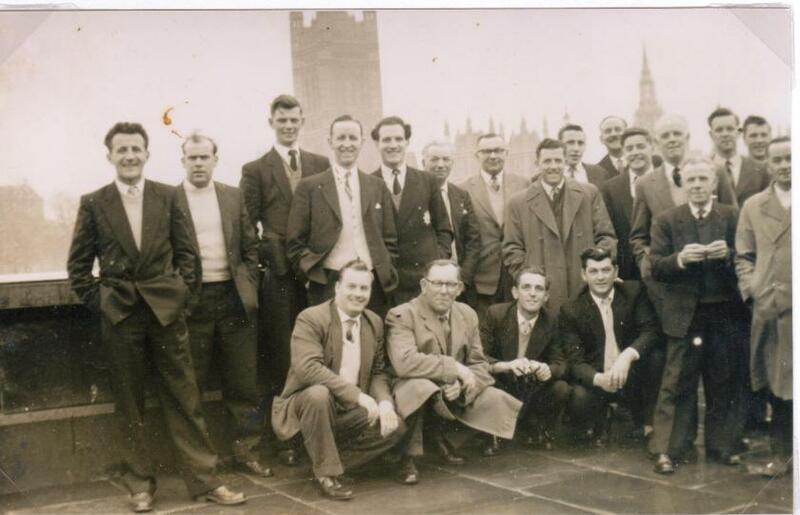 * Two vehicles from the London Hotel took the men through Totnes, Harbertonford and Halwell, ending at Slapton Sands. They enjoyed a 'sumptuous dinner' at the Torcross Hotel, and had boating and a trip to Start Lighthouse before tea. They returned to Ashburton at about 11 o'clock. *Wayzgoose - An annual summer entertainment, originally connected to the printing trade. It often consisted of a dinner and a trip into the country. H Stevens supplied the oak coffin for the funeral of Mr John Berry in 1889. The Masons decided to erect a Masonic Hall in 1889. Bro. Henry Stevens had donated the site, near the railway station. 1892 Henry Stevens claimed - and won - £34 9s 10d from Cornelius Bawden, purser of the Wheal Agar Mine in Cornwall. He proved in the Vice-Warden's Court that he had done £1136 0s 3d worth of work, but had only received £1101 10s 5 and a half pence. Technical workshops were built as an extension to Ashburton Grammar School in 1892. It was intended to teach chemistry, engineering, blacksmithing, carpentry and joinery. The chemistry section had benches supplied with gas, water and bunsen burners; and the engineering section contained a smith's forge. Henry Stevens was the contractor. The following year saw the completion of the Capital and Counties Bank, on the site of the old Duke's Head Inn. The red stone used to face the walls came from Bishopsteignton, and ornamental features on the doors and windows were of Monk's parkstone, from Bath Stone Firms Ltd. Messrs Woolliscroft and Sons of Hanley supplied the tiles for the roof. A private entranceway led to living accommodation, including a dining and drawing room, five bedrooms and a bathroom. Electric bells were fitted, together with speaking tubes connecting the floors. There was a dinner lift near the kitchen, and hot and cold water throughout. Henry Stevens had been the contractor; he had also built the recently constructed Devon and Cornwall Bank. 1894 Ejectment orders were issued at the Ashburton Petty Sessions against Susan Parnell and John Harvey of Heavyhead Lane, on behalf of Henry Stevens. Mr Stevens said he 'did not wish to be harsh', but there had been complaints from neighbours. A fire behind the Globe Hotel affected property belonging to H Stevens in 1894, (which might have included) a Co-operative Society stable, and stores of coal, wood, grain, flour etc. belonging to John Beard. The damage was extensive, and the cause was being rigorously investigated. The Cornubian and Redruth Times announced in March 1895 that Mr Henry Stevens of Ashburton, who had built the Redruth and other viaducts, had died a few days previously. Gertrude Alice Stevens died in May 1900 at Kingsbridge. She was the widow of the late Henry Stevens of Hazeldene, Ashburton. Thomas Foaden advertised in 1851 that he was 'contractor for the tolls' for Ashburton market. Rooms could be rented for lectures, bazaars, auctions etc. Mr Thomas Foaden, builder, died on April 5th 1854, aged 38. He left a widow and four children. Susanna is shown as a widow in 1861. On the census of that year she is living in West Street with her brother Thomas Pearse, a master butcher. In May 1874 John Foaden, an Ashburton builder, was fined 40s including costs (the full penalty) for boarding a train whilst it was in motion. He had jumped off the platform at Totnes, run across the line and tried to board 'an Ashburton carriage.' He fell, but got up and on the second attempt got through the window of the carriage the guard was riding in. He had pleaded guilty. 1878 W L Jones and Sons, wine and spirit merchants, opened new bonded stores on Exeter Quay. The plans were by C E Ware, and the building was erected by Mr J H Foaden of Ashburton. In 1883 Mr. Foaden of Ashburton was the contractor constructing the boarding and sheds on the twenty acre site at Bideford chosen for the Devon County Agricultural Show. William Pengilly of West Street, builder, was amongst those qualified to serve as a juror in 1901. Henry John Almond's grandfather, Nicholas (Kingstone) Almond, was born in Blackawton, Devon, but at some stage moved to Kent, where his children were born. These children included son Thomas. In 1881 Henry Almond, the son of a builder, together with his two brothers, was working in Enfield, Middlesex, for his father Thomas. Thomas Almond employed 12 men and 8 boys. Henry (this time named as Henry John) was still with his father in Enfield in 1891, aged 27 and single. Henry John Almond married Emily Caroline Kent in the Edmonton registration district in the December quarter of 1892. Their daughter Honor Edith was born the following year, also in the Edmonton district, but when Henry Cecil Almond was born in 1896 his birth was registered in West Ham. By 1897 H J Almond, contractor, was in Ashburton, where he had two steam derrick cranes for sale or hire. The first was a 3 ton combined hand and steam crane by Forrest and Co., and the second a two ton crane by Butters Bros. In May the next year he was selling (cheap) a stone waggon that would carry 3 tons. He was also selling a circular saw bench that would take a 36 inch saw. The bench, which had driving and loose pulleys, brass bearings and in and out gear, was £18, including 3 saws. The same month Almond, contractor, Ashburton, was seeking to employ a painter. Ugborough School needed to erect a new classroom for infants in June 1898. Mr H J Almond's tender was £155, Mr A C Johns (Ugborough) was £105, and Messrs. F Watts and Son, (Ugborough) was £95. The £95 tender was accepted. February 1900. Walter Tiddy was hit in the abdomen when the fastening of a driving belt flew apart and he was taken to Ashburton Hospital. He was employed by Mr H J Almond. 1900. Mr Henry Almond, of Ashburton, had recently retiled the aisles of Landscove church. 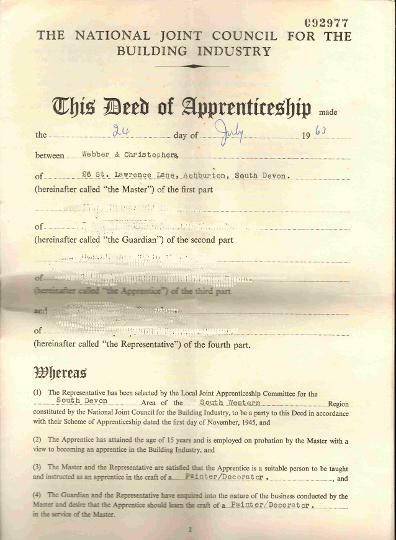 Henry John Almond, a builder and contractor living at Hazeldene, was amongst those qualified to serve as jurors in 1901. In the census of that year 37 year old Henry is listed as a builder, born in Enfield, Middlesex. With him are his wife Emily C, daughter Honor E and son Henry C.
The birth of Herbert John Almond was registered in the Newton Abbot registration district in the September quarter of 1901. In 1902 at the Golden Lion there was a sale of 300 oak and other trees from Waye, Alston, Pitley, and Dolbeare. Amongst the principal buyers was Almond of Ashburton and Hatch, also of Ashburton. George H Darke, an employee of H J Almond and Co., was buried in February 1903. The coffin was carried on a timber waggon, drawn by the team of horses that Mr Darke used to use. In February 1904, when H J Almond and Co. were demolishing an old house in West Street, two men, Campion and Tiddy, fell through the floor from the top storey to the basement. Tiddy was badly hurt in the head, but was making progress; Campion was uninjured. In August 1905 it was reported at the Urban District Council that H J Almond and Co.'s tender had been accepted for taking off a dangerous corner at the gasworks. By April 1906 H J Almond and Co., Ashburton, was in liquidation. Anybody having a claim against the company had to send full details to Totnes solicitors T C and G F Kellock. May 1906. F J Badcock had recently acquired the business of H J Almond and Co., and Messrs. Sawdye and Son were holding an auction at the yard near the Railway Station. Items for sale included an 8hp portable engine, vertical, circular and band saws, turning lathes and cranes, and about 10,000ft of oak, ash, elm and beech planks. The Almond family were living in Herne Bay, Kent at the time of the 1911 census. Henry was now a house agent. Herbert John, the youngest son, had been born in Ashburton. 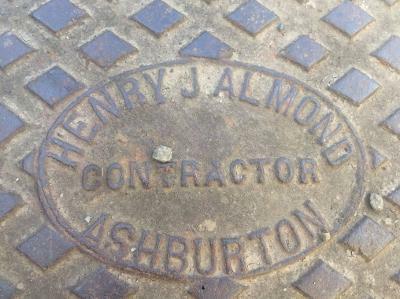 Above: Drain cover with the details Henry J Almond, Contractor, Ashburton. 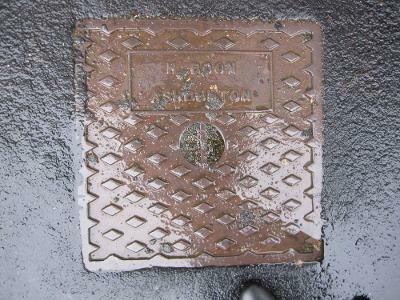 The cover and complete drain system is at Oxenham Farm, Sigford, known at one time as Sigford Farm. 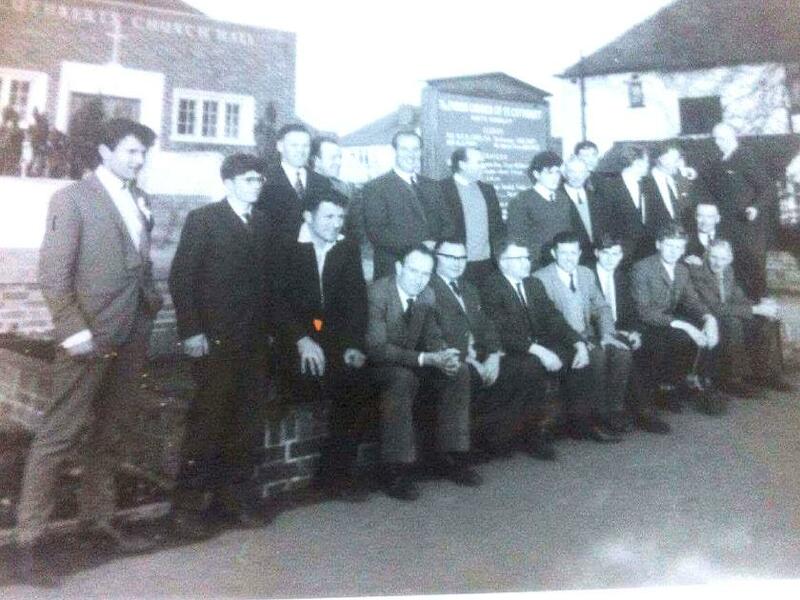 Very many thanks to Oliver Bosence for both the photo and the information about Oxenham Farm. In 1909 a fire in an outbuilding attached to Hazeldene House threatened to spread to the house itself and Mr Badcock's large timber yard. 1918. Fire caused £1500 to £2000 worth of damage to the premises of Mr F J Badcock, a builder and timber merchant, near the railway station. Douglas Berry fell from a pair of steps in 1925, dislodging a stone which severely injured his leg. An apprentice to Mr F J Badcock, he was taken to the local hospital for treatment. 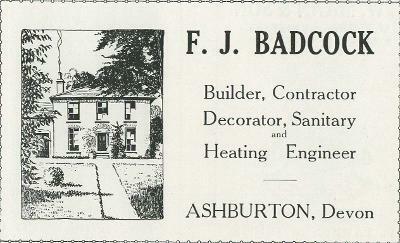 Above: Advertisement for F J Badcock from a Golden Lion promotional booklet, undated but probably late 1920s. Above: Workmen from Badcock's, working on the primary school in 1935. The men marked are the father and grandfather of George Stone. 'Eales, builder, Ashburton' was selling a newly built small villa in Ashburton in 1931. It had 3 bedrooms and 2 reception rooms, hot and cold water, gas and electricity. Standing in its own grounds, the asking price was £850. William Lear, formerly a builder and undertaker at Ashburton, died in February 1940. He was 96. Mr F Langler was retiring in 1943, and Rendells were selling 26 Station Road* on his behalf, together with the goodwill of an established builder's business. The property consisted of a 10 roomed house, a builder's yard and stores. 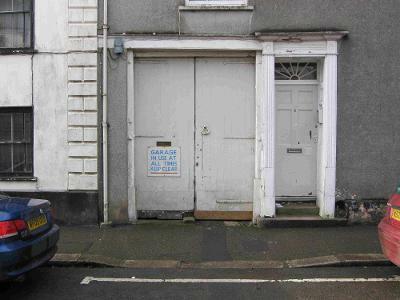 Henry S Christopher, a carpenter born in 1912, was living at 4 Jubilee Road, Newton Abbot, in 1939. With him was his wife Muriel M.
Meanwhile Sidney J Webber, a mason born in 1910, was living at 2, Rentor View Cottages, Newton Abbot, with his wife Rita E.
Left: When Cliff Ellis removed some wallpaper at 2, Avenue Terrace he found this scroll drawn on the wall. Many thanks to Cliff for this. 'We had a two-wheeled handcart for moving equipment around the town. Ladders, steps, paint, dustsheets - everything was tied to it. I used to be very embarrassed when I was allocated the task; it was in use until the 1970s. Right: Doors leading to the former Webber and Christophers' yard, at the bottom of St Lawrence Lane. Paddy Harding once had to gold leaf the hands and numerals on the clock on St Andrew's Church. He was lowered down on a Bosun's chair, which was basically a plank suspended by ropes. Gold leaf was an expensive product that came in books interleaved with tissue paper. It was tricky to use: you had to size the object with gold size, rub a brush on your hair to create static electricity, and then pick up a leaf of gold with the brush. Positioning it on the object whilst the size was not too wet (it which case it would come through the gold and dull it) or too dry (so that it wouldn't stick) you then let it dry, before burnishing. Paddy went to pick up a gold leaf, the wind blew the whole book out of his hands, and sheets of it blew all over the churchyard. 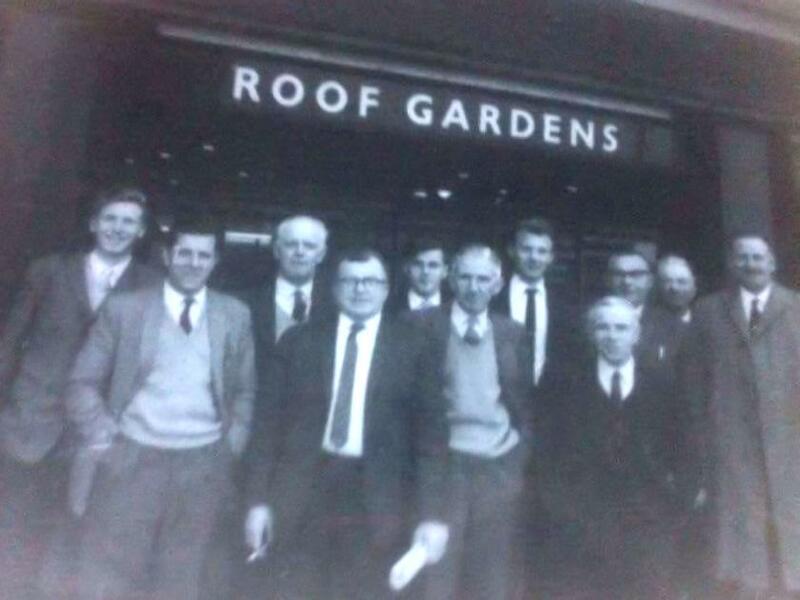 From a work colleague of Paddy's.